Those who are about to switch to Exchange 2010 from Exchange 2007 will encounter major changes (and challenges) in the Exchange permissions model. For those still on Exchange 2003 (or earlier ..), changes are more or less the same. That seems limited and very task oriented. Memberships are managed using the Exchange Management Console or through the cmdlets Add-ExchangeAdministrator, Get-ExchangeAdministrator en Remove-ExchangeAdministrator. Also, by default, Recipient Administrators get permissions on all recipients within the Exchange organization. Domain or OU delegations are possible, but require a little additional configuration (see http://technet.microsoft.com/en-us/library/bb232100.aspx). Here comes Exchange 2010. New in Exchange is management of delegation and permissions through the so called Role Based Access Control model, shortened to RBAC. RBAC is partially configurable through the RBAC User Editor (Exchange Management Console > Toolbox) or fully using cmdlets. The RBAC model is based on three pillars, Who, What and Where. The Who (not the band) determines which user (in RBAC users are represented by mailboxes) or group (Universal Security Group) receives permissions. This information is stored in Role Groups, which can be managed through the RoleGroup and RoleGroupMember cmdlets. To manage a Role Group, one has to be a member of the Organization Management Role Group or be the manager of the Role Group as determined by the ManagedBy attribute. Pay attention, members of the Organization Management Role Group manage the Organization Management Role Group. You could create a situation where nobody is able to manage anything. Take note that a Role Group is nothing else but a Universal Security Group with a special flag indicating the USG is a Role Group. In Active Directory, Role Groups are located in the Microsoft Exchange Security Groups OU. The What decides what permissions are assigned by creating sets of cmdlets and parameters. This information is stored in RBAC’s Management Roles which can be managed through the ManagementRole and ManagementRoleEntry cmdlets. What we see are all cmdlets and parameters available to the Management Role “UM Mailboxes”. Be advised only custom Management Roles can be removed and all permissions of a Management Role should be removed before the Management Role itself can be removed. By specifying the recurse parameter in the Remove-ManagementRole cmdlet you can perform cascaded deletes of custom Management Roles with a parent-child relationship. Where determines the scope, which can be anything from a certain group of users, a server or an Active Directory site to an Organizational Unit or complete organization. RBAC has two types of scopes. First are Implicit scopes, which are scopes defined by the default Management Roles, e.g. Organization, MyGAL, Self, MyDistributionGroups, OrganizationConfig and None. Second type are Explicit scopes, which are predefined or custom scopes. Configuration Write Scope: Which AD configuration objects one can write to. As said earlier, new Management Role entries must be based on an existing Management Role. At creation time the new Management Role will inherit (i.e. copy settings) the original scopes from the parent, after which they can be changed. Also, remember that the Write scope must be equal or smaller than the Read scope; you need to be able to Get things before you can Set things. ServerList to filter server names. Regarding the possibilities of filtering Exchange 2010 refers to Exchange 2007 documentation, see http://technet.microsoft.com/en-us/library/bb738155.aspx. For more background information on scopes, see http://technet.microsoft.com/en-us/library/dd335146%28EXCHG.140%29.aspx. 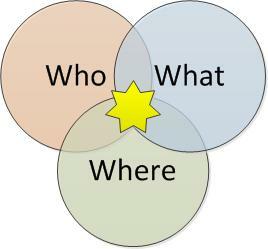 After defining the Who, What and Where we can start combining these elements by using Role Assignments. A Role Assignment is the link between a Role Group and a Management Role, with additional attributes like Recipient and Configuration Scopes. As we can see, Microsoft used a combination of the ManagementRole and RoleGroup names to label Role Assignments. This is good practice and makes it easier to understand – and remember – which Role Assignment affects which Management Role and Role Group. Using New-ManagementRoleAssignment we can assign a ManagementRole to a Role Group or other USG, a policy (more on this perhaps in another article) or user (mailbox), e.g. The Exchange 2010 and RBAC model create new opportunities for customers. Large companies, who probably already have complex delegation models in-place, will like the more fine grained controls to support business requirements. Their challenge lies in converting their existing model to the new designed RBAC model. For smaller customers the default set of roles, groups, scopes and assignments might appear overwhelming at first, but eventually be found an asset as it supports least privilege security model and get rid of the (Exchange) Adminsistrators surplus. This entry was posted in Exchange 2010 and tagged Exchange2010, RBAC, Security by Michel de Rooij. Bookmark the permalink. Cannot process argument transformation on parameter ‘Identity’. Cannot convert value “Reset UM Pin” to type “Microsoft. ange.Configuration.Tasks.RoleEntryIdParameter parameter isn’t valid. Check the value, and then try again. Thanks for spotting that one. Should add “\*” after “Reset UM Pin”, e.g. I am still getting the same error as Glen even after ensuring the backslash is in place (See examples 1 and 3 below). But I have noticed that if I remove a single RoleEntry at a time it works? (See example 2 below). Please see my commands and output below. Thanks for any advice. Cannot process argument transformation on parameter ‘Identity’. Cannot convert value “NIAMR_HelpDesk” to type “Microsoft.Exchange.Configuration.Tasks.RoleEntryIdParameter”. Error: “The format of the value you specified in the Microsoft.Exchange.Configuration.Tasks.RoleEntryIdParameter parameter isn’t valid. Check the value, and then try again. Confirm Are you sure you want to perform this action? -WhatIf” management role entry on the “NIAMR_HelpDesk” management role. There is already a management role entry matching the name “remove-m*” on the role “NIAMR_HelpDesk”. Specify a unique value. Missing closing ‘). implies there’s an error or typo in your complete command. Can you paste it here? Sorry, didn’t have time to answer you properly earlier. Is this still current?